Help needed for The County Garden Show on June 8th. Set up and Take down. Set up will take place on the evening of June 7th and the morning of June 8th. Take down will occur at 5PM on June 8th as we have to get the place ready for the Green Trust’s Music Festival to be held at 7PM that evening. Admission Takers at the door. This year we are charging $2 admission, so we need people on the door to take the money. Ticket Takers for Paul Zammit. Ticket Takers for the Victorian Tea. Victorian Tea helpers, serving, washing up etc. Raffle Ticket and Membership Booth needs help selling tickets and memberships. Miscellaneous – to help wherever help is needed. Please email Howard Hunter or Anne Reeves by using the email form on the Contact Us page of this website to let them know where you would like to help. Thank you for your support in this exciting venture. Howard Hunter opened the meeting by welcoming members and guests as well as new members, and reminded all to sign in on the meeting sign sheet which would be passed around. 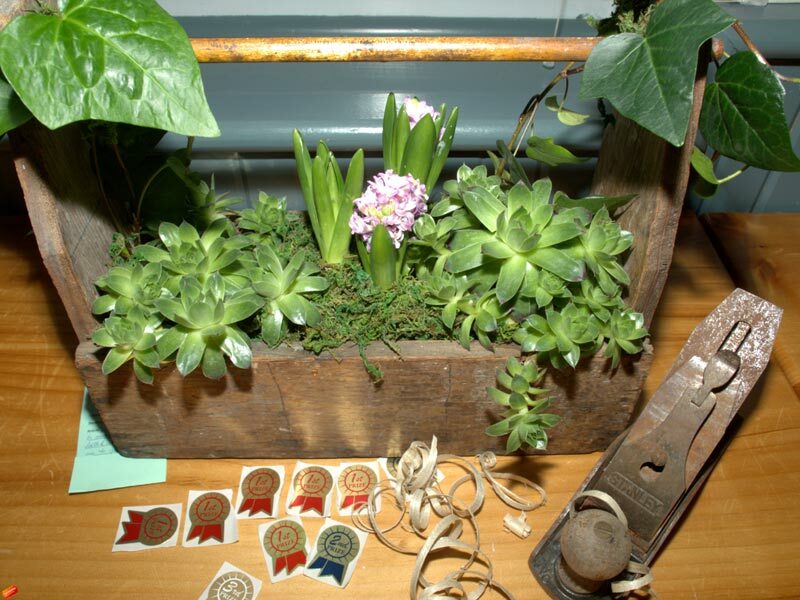 Howard also reminded those present that the County Garden Show needed volunteers on the day to help with set-up, door admission, Victorian Tea, and the Raffle Table. A sign-up sheet was available at the meeting, and a page with a reminder and details can be found here. 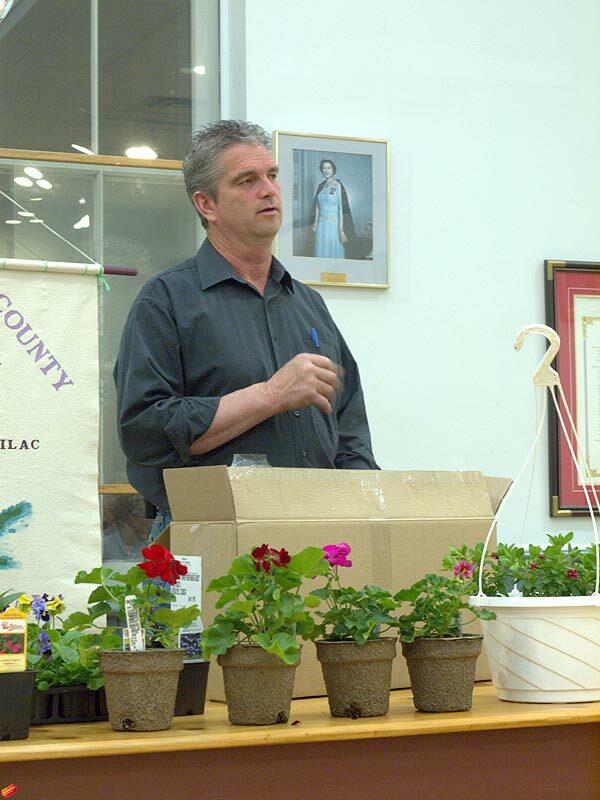 Walter McGee gave an overview of the Flower Show rules and categories including the ‘provincial flower’ category – a somewhat whimsical category combining actual flowers with artifacts. Full details on the categories, etc. 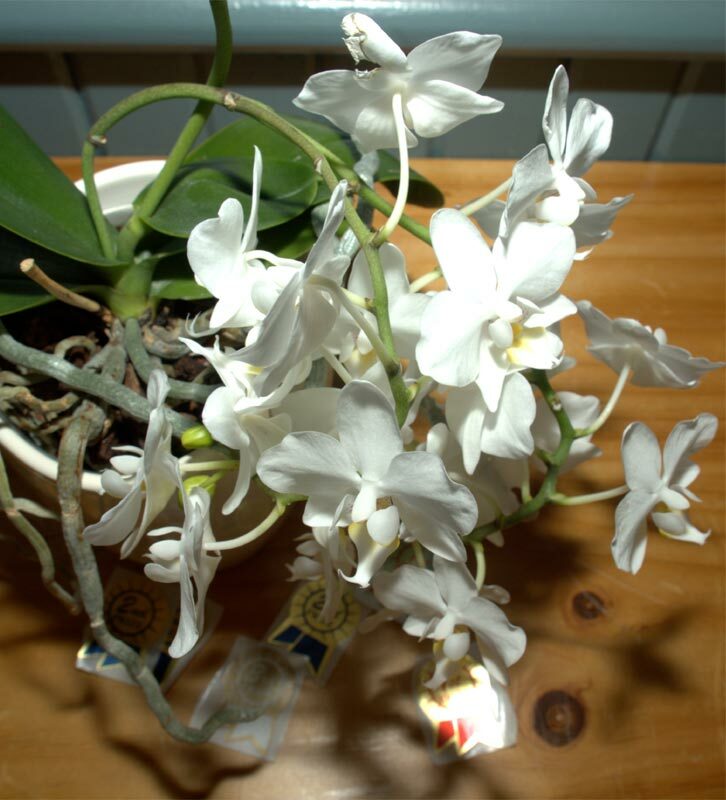 are in the Flower Show brochure which is available for download here [486 kb pdf]. Walter and Marianne Malachowski reminded members about the Green Trust’s Music Festival to be held following the County Garden Show and beginning at 7:00 pm with the younger performers and continuing on until 10:00 pm. Tickets can be obtained from Walter at $5/ticket. More details of the music festival to be posted later this month. Anne Reeves gave the members an update on the vendors and sponsors for the County Garden Show (full details here). Anne noted that interest was high and the vendors and sponsors were pleased with the greater level of advertising we were doing. Remember to support these vendors and local sponsors! Howard introduced the meeting’s speaker – Court Noxon – who would be presenting on wild flowers of PEC. 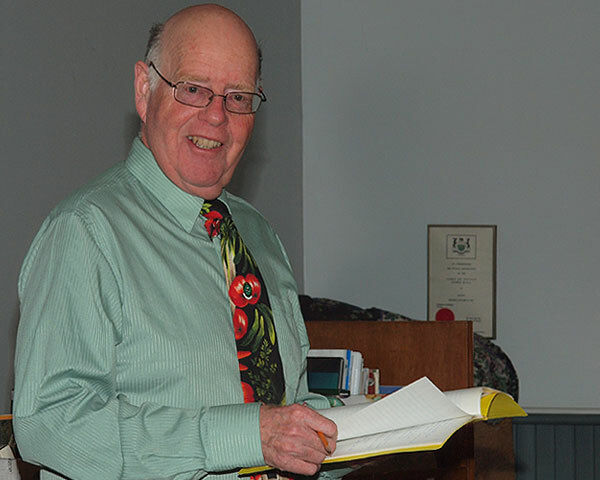 The presentation’s special emphasis would be on the species that he believed to be endangered or that had disappeared completely over the past 20+ years he had observed and documented wildflowers in the varying habitats found in PEC. PEC has seven distinct habitats each of which has a difference mix of plants (and animals); beaches, dunes and pannes, forests, meadows, marshes, fence bottoms, and alvars. Sea rockets have been absent from PEC beaches for at least five years. In the dunes and pannes, fringed gentian and lobelia are ‘vulnerable’; the beach pea and hoary puccoon are both no longer found in the dunes and pannes. The forests in the interior of Sandbanks are changing as the climate and environment changes. The American beech has become stressed and is more susceptible to insect damage; the pinesap and yellow lady’s slipper flowers are no longer in the forest. Meadows and marshes are two habitat types that are gradually disappearing or changing. Monarch butterflies – which once filled PEC’s meadows are now an ‘at risk’ species. Changing marshes have caused a loss of river otters and snapping turtles and wild rice, southern wild rice, and cardinal flowers are plant species no longer found in PEC marshes. The ‘fence bottom’ habitat, though widespread, is changing. As farming practices change, hedgerows are disappearing which affects the air flows across the fields. Butternuts are rarer because of hedgerow clearing, wild grapes, wild plum, and hawthorn are also almost all gone. In the alvars, early buttercup and prairie smoke – despite intense conservation efforts – are almost all gone. 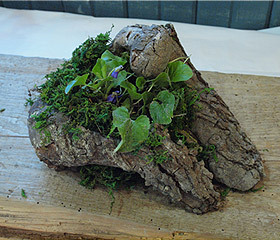 The overall alvar habitat is naturally changing and many of the ‘traditional’ alvar plants are becoming less populous. While biodiversity reduction is ‘bad news’ no all change is bad. Court closed his presentation by mentioning some good news, like the arrival (or first sightings) of corn cockle and Nora Barlow columbine. Court’s web site provides a comprehensive and easy-to-use database of descriptions, habitats, colours, images and more about PEC’s wildflowers. You can also get a copy of Court’s lavishly illustrated book entitled Field, Forest, Hedgerow’ from Books & Company in Picton. 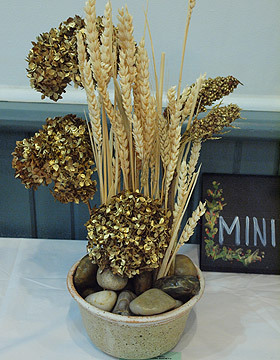 The mini show topic was ‘forced bulbs or wild flowers which you have dried or self-taken photographs of wild flowers’. Mini-show entries were judged by the members at large. 1st place was shared by Gwen Reilly and Kim Katanik-Kuris [upper pair above], 2nd place went to Mary Jenkins and 3rd place to Arline de Bourbon [lower pair above]. Click the images to see larger versions. The Seed Library (at the Picton Library) had a successful start on Saturday April 6th. To make it clear what the Seed Library is about, the idea is that people can contribute seeds, generally seeds that they have gathered and preserved themselves. The packets need to to be marked with the following information: name of seed, date gathered, heritage or organic, where grown. The seeds can then be donated to the Seed Library. In return you can peruse what they have in stock and take home some seeds that you find interesting. All the library asks is that you make a return next year with more seeds. 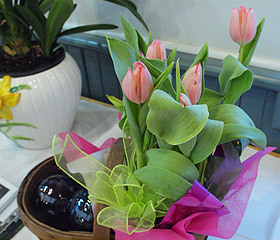 Currently they have a good selection of tomato and vegetable seeds, along with some flowers and herbs. You and your seeds will need to be checked out with your library card. If you are interested in seeing what they have available, or getting involved as a volunteer, then just call in at the library. They will be glad to see you. Longer days and better weather had a nice effect on the turnout for the March meeting. Over thirty members and guests were welcomed by President Colleen Green as she opened the meeting. Following announcements about memberships, discounts available to members from area Garden Centres, the availability of tickets for Paul Zammit’s presentation at the County Garden Show and Green Trust Music Festival tickets, and a reminder to vote in the mini-show, Colleen introduced the meeting’s guest speaker – Greg Moore (assisted by CJ Dearlove) from Lockyer’s Country Gardens. 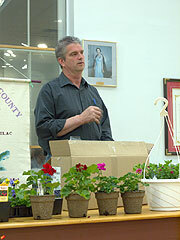 Greg’s topic was ‘New Perennials and Annuals’. 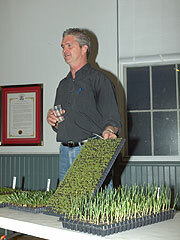 Greg provided an action-packed 60 minutes with many, many example plants to explain his points and plenty of audience interaction. 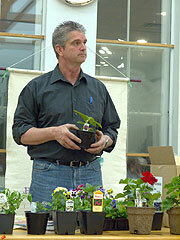 Greg began with some ‘inside information’ on how a commercial garden centre works. 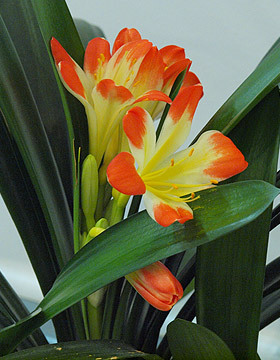 He explained the supply chain that brought plants to Lockyers and which included breeders in places as diverse as Brazil and the Netherlands; stock cultivated at the breeders – and a brief lesson in understanding the wealth of information on the the label; rooting stations that produce rooted plants from stock; and the brokers who assemble the orders placed by garden centres. 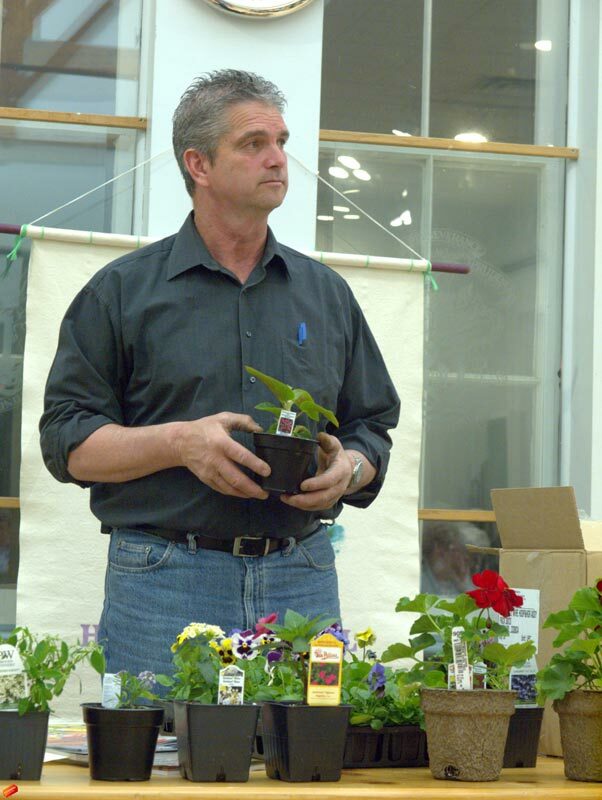 Greg introduced the members to a range of annuals new for 2013, including a really black petunia, and Sunpatiens (similar to the New Guinea impatiens) which will tolerate sun and heat. Also he showed us Lobelias Lucia and Laguna which are both heat tolerant, and a Begonia Solenia which likes full sun. Included was a geranium Calliope, a cross between a zonal and ivy geranium, which comes in a very dark red. Greg concluded by giving an overview of trends he sees: gardening in general is on an incline with particular interest in adding features such as patios and water features. 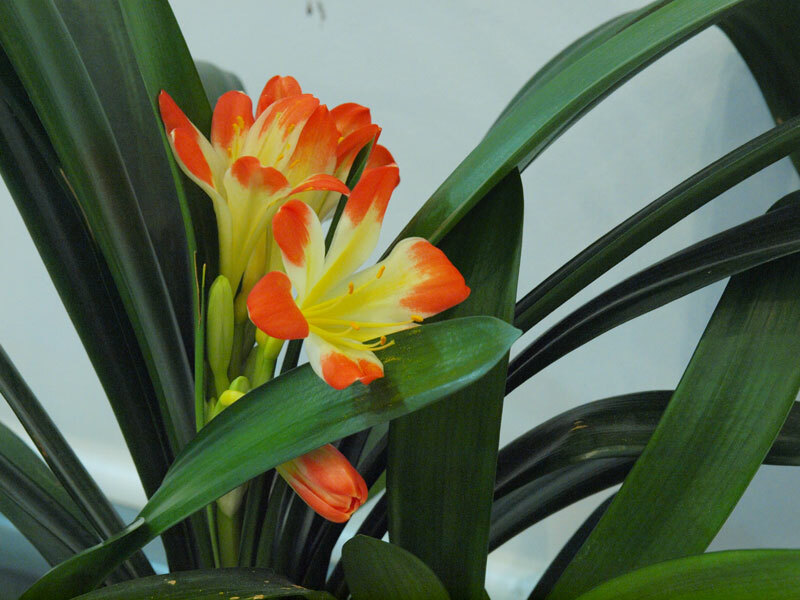 In response to customer requests, Lockyers are introducing citrus plants, flowering ‘tropicals’, succulents to suit a hotter and dryer growing season, and home vegetable growing. Charles and Arline De Bourbon, celebrating their 60th wedding anniversary this year, were the winners of the members prize donated by Lockyers – a spectacular hydrangea. 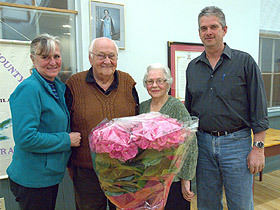 President Colleen Green thanked Greg and CJ for their presentation. 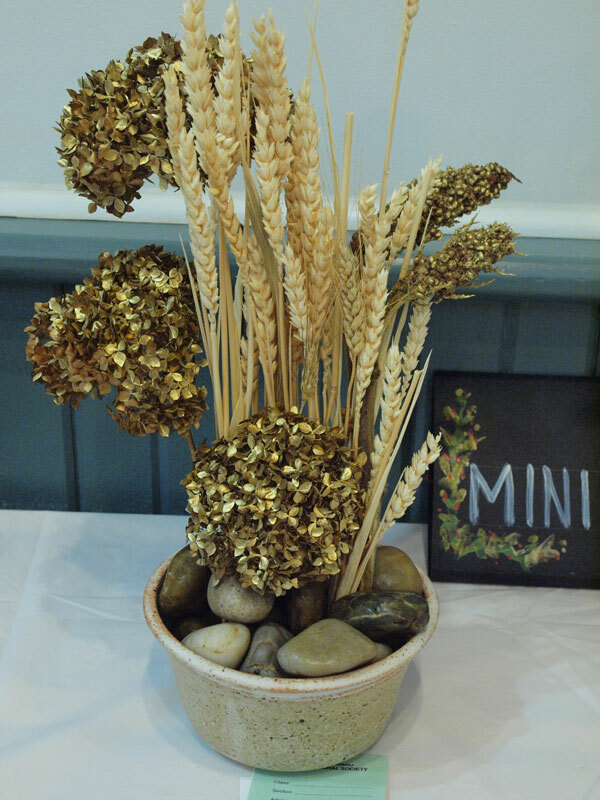 The mini-show topic was ‘Your favourite perennial or annual flowers or a treasured house plant’ which provided plenty of scope for the entrant’s creativity. Six quite different entries were offered. Mini-show entries were judged by the members at large. 1st place went to Kim Katanik-Kuris’ [uppermost in group above], 2nd place to Mary Jenkins [lower-left], and 3rd place to Gwen Reilly [lower-right]. Click the images to see larger versions. 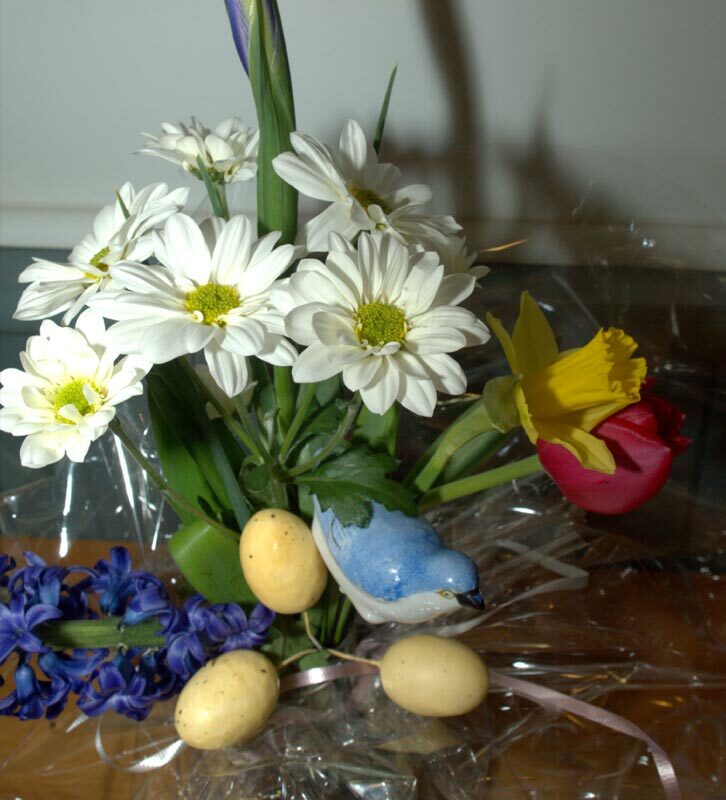 The Save Ostrander Point Appeal of the PEC Field Naturalists is inviting clematis specialist Peter Keeping to speak at Bloomfield Town Hall on Saturday April 27 from 2:00 until 3:30 pm as part of their fund-raising effort. Details at www.saveostranderpoint.org/ or call Sandra at 613 393 5577 for more information. The library is planning on starting a ‘seed library’ at the Picton branch where people can both contribute as well as take away (‘borrow’) seeds. 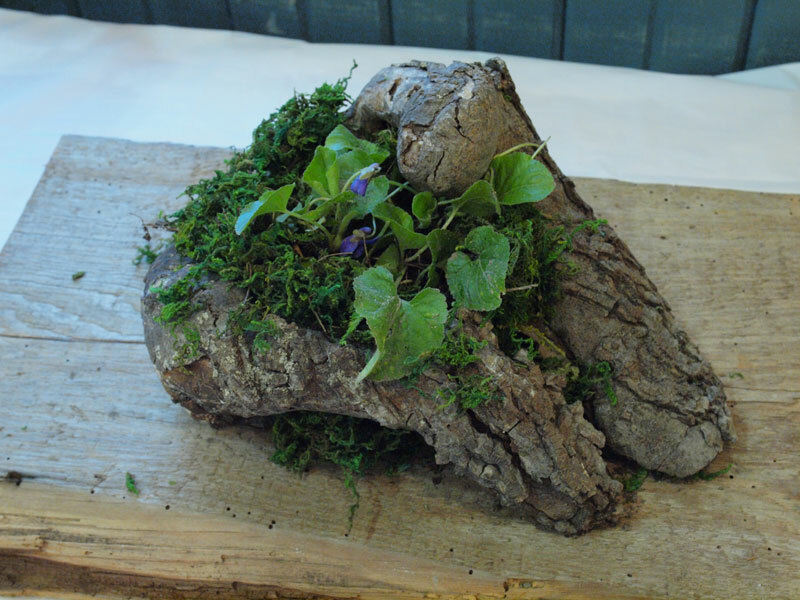 The intent is to provide education about starting plants from seed, foster interest in ‘growing your own’, and provide access to a variety of seed (both ordinary and heritage types). Despite the bad weather, a good number of members and guests were on hand for the February meeting. Colleen Green welcomed our new members – inviting them to stand and be recognized – and also reminded guests that they should sign the Guest Book. 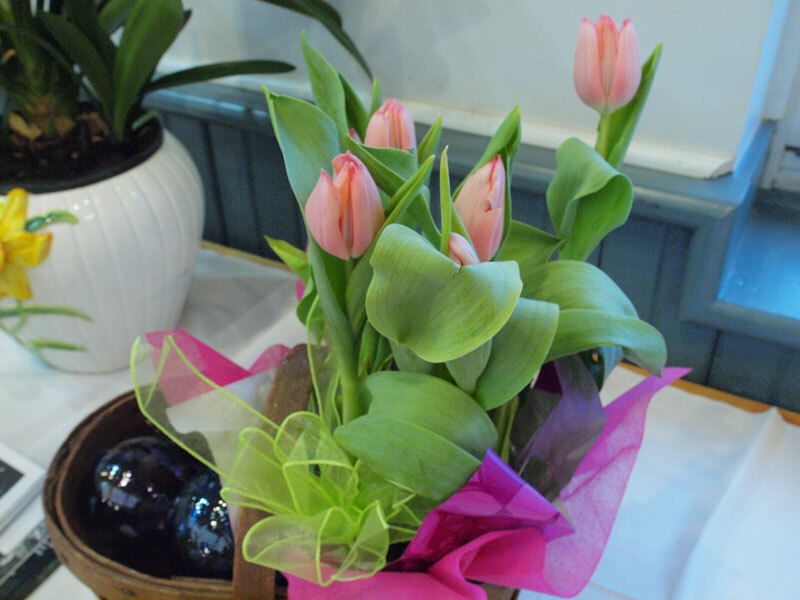 Colleen advised everyone that sales of vendor spaces for the County Garden Show were going really well (kudos to Anne Reeves and her team), noting that a vendor list would be published and regularly updated on the web site in advance of the show. In other show news, buying an advance ticket for Paul Zammit’s presentation would get you into the show for free ($2 saving), and the Green Trust Music Festival (which follows the show at 7pm) tickets were available from Green Trust members for only $5. 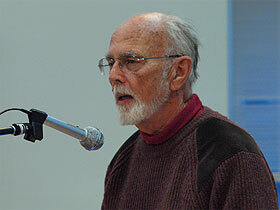 Walter McGee, our featured speaker was introduced. His topic was ‘A history of vegetables – from asparagus to zucchini’ and you knew it was going to be interesting after just one glance at his tie! 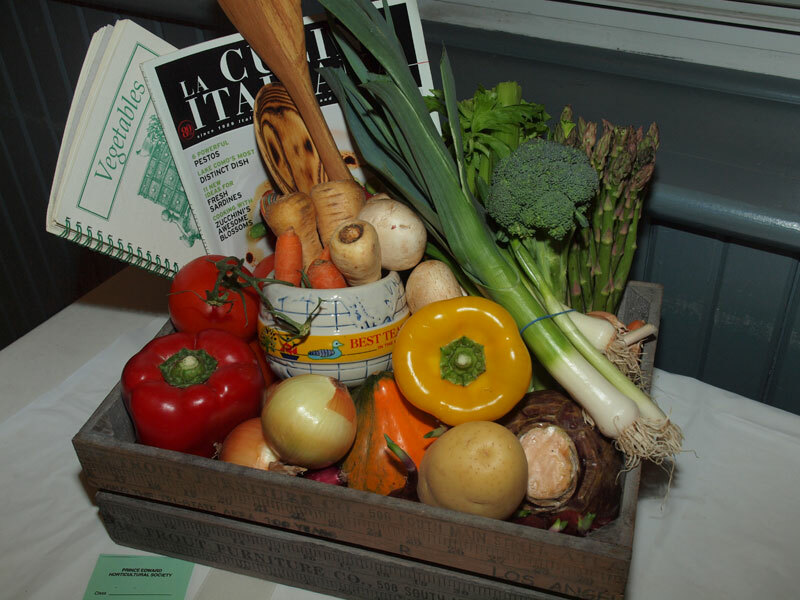 Walter gave an informative and entertaining talk on vegetables, interspersed with historical and social commentary on many of his chosen vegetables. Did you know that potatoes were undesirable when first introduced into France? Fencing them in with a few gaps in the fencing prompted some of the starving peasants to ‘liberate’ the veggies and eat them … thus popularising an important food source! Walter’s talk was accompanied by many slides of mouth-wateringly good-looking vegetables from asparagus to zucchini and dozens in between, and generated lots of questions and comments from the audience. 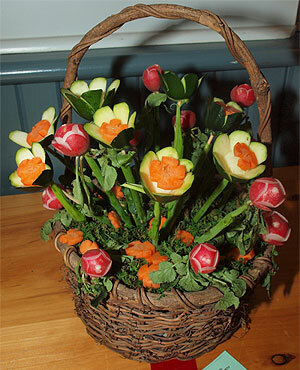 The mini-show topic was ‘an arrangement of any number of your favourite vegetables’. 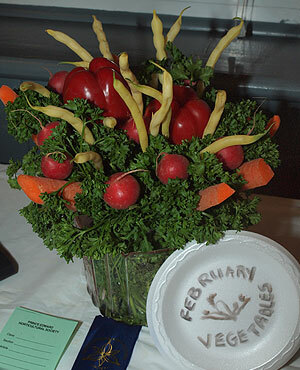 While February isn’t exactly prime vegetable season, the topic proved no obstacle for our contest entrants, all of whom produced great exhibits. Not counting Walter’s spectacular vegetable tie, there were four entries in the mini-show. 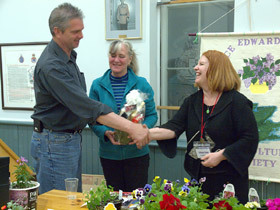 Mini-show entries were judged by the members at large. 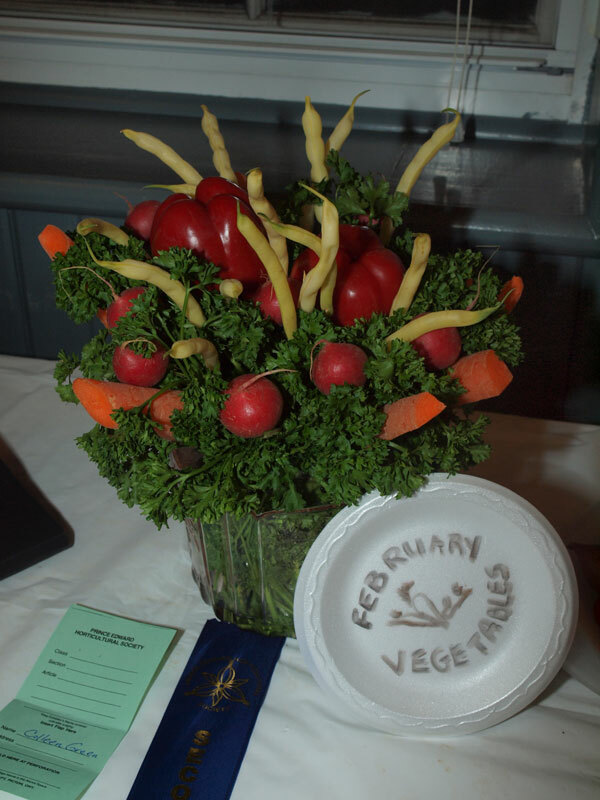 1st place went to Kim Katanik-Kuris’ spectacular vegetable flowers [upper-left], 2nd place to Colleen Green [upper-right], and 3rd place to Gwen Reilly. Click the images to see larger versions. 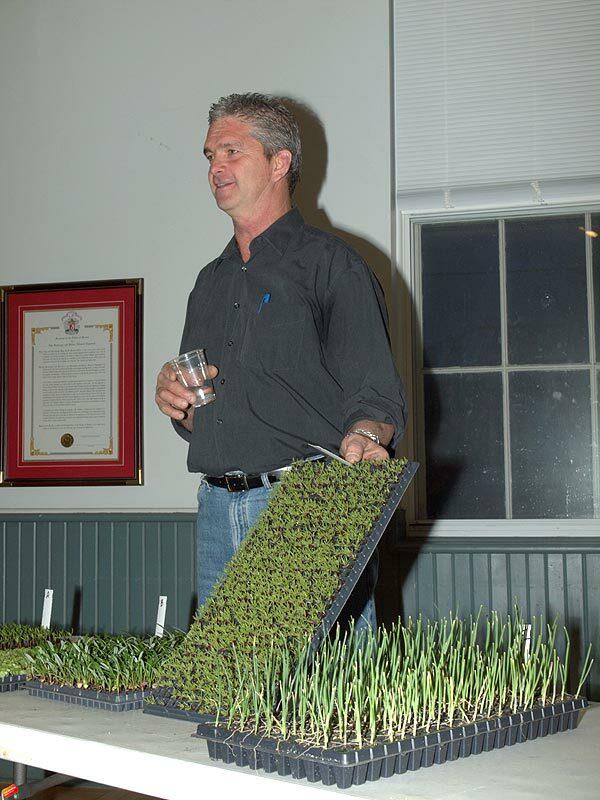 Our guest speaker at the February 27 members meeting will be Walter McGee and his topic will be “History of Vegetables – Asparagus to Zucchini”. In keeping with the vegetable theme, February’s mini-show will be an arrangement of any number of your favourite vegetables.